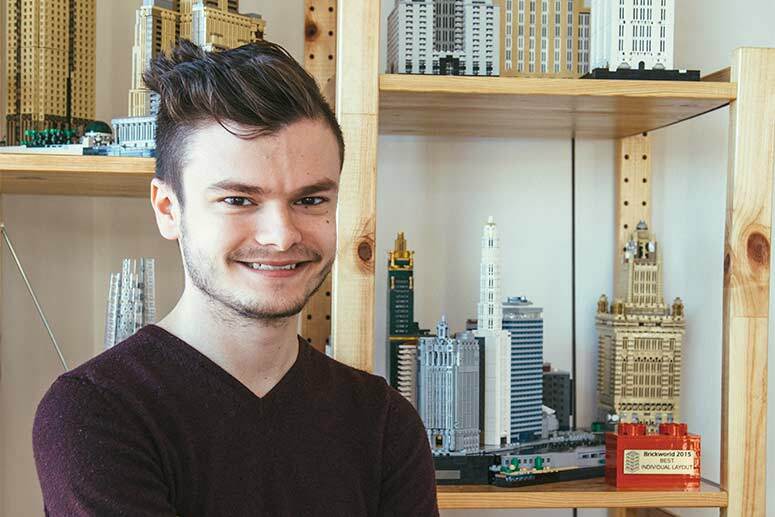 Rocco Buttliere (ARCH 4th year) is on his way to becoming an architect, but what he is right now is a creative and masterful bricklayer who started his training at age 6. Buttliere’s bricks are not made of clay and shale but rather, acrylonitrile butadiene styrene or polycarbonate—the two plastic components behind the most commonly fabricated LEGO bricks and plates. 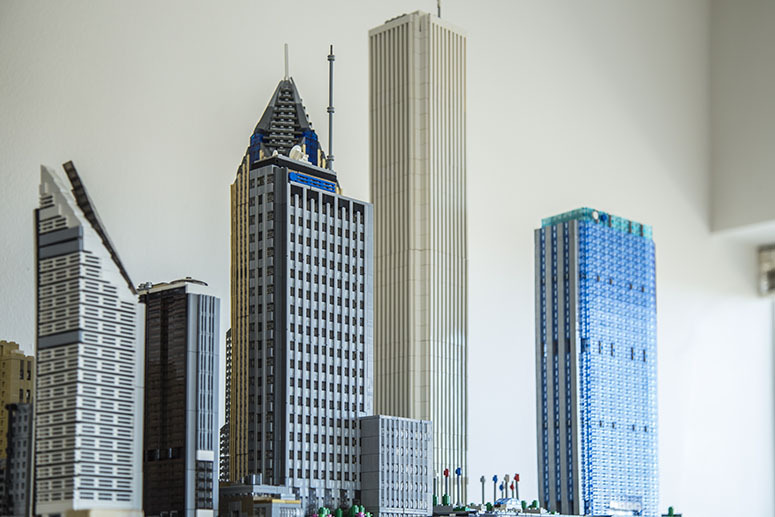 For the past seven years, Buttliere, from Buffalo Grove, Illinois, has been paying homage to Chicago by recreating chunks of the city in LEGO, Lilliputian-style, at a scale of 1:650. Last December he flew to London to participate in BRICK 2015, a five -day expo of all things LEGO. Buttliere raised the money for his freight costs for his 43 buildings, including the Chicago-scape and international models such as the Houses of Parliament (London), the Oriental Pearl Radio & TV Tower (Shanghai, China), and the Chrysler Building (New York), through Kickstarter. 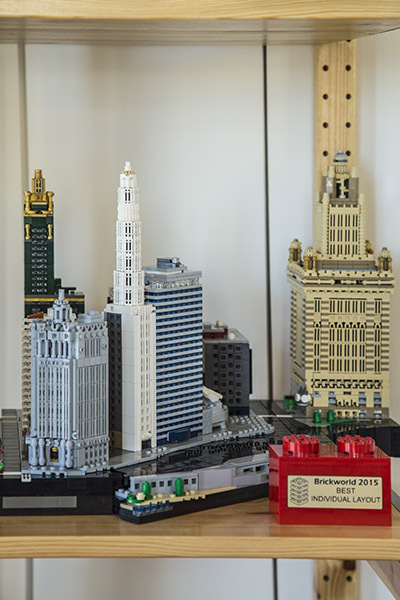 The public was able to view Buttliere’s miniaturized versions of Marina City, Tribune Tower, and many buildings comprising the city’s skyline in the lobby of AMA Plaza in Chicago’s North Loop neighborhood (also done in LEGO) this past February. 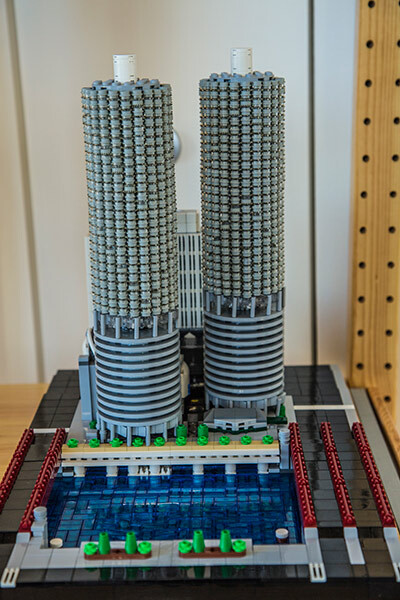 Buttliere also participates in Chicago’s yearly Brickworld convention in June and will have all his models on display at Illinois Tech’s Block City event slated for July 23 on Mies Campus. How did your interest in LEGOs develop? I remember being interested in LEGO ever since the first grade. I started with Harry Potter sets and then moved on to Star Wars; it was always aligned with whatever I was interested in at the time. LEGO started as a hobby first and foremost, but at this point it’s become an artistic medium for me to express something from real life. It’s a passion. Clearly, you’re also passionate about Chicago. Tell us how you are able to capture the realism in your LEGO urban landscape. I use Google Earth a lot. It’s a really good tool because it has 3-D models of the buildings so I can look at all of the details and real-world dimensions, and make measurements. When I’m designing the buildings I switch back and forth between that and the LEGO digital-design software. I order pieces of LEGO from BrickLink [the world’s largest online marketplace for new and used LEGO pieces]. It’s pretty costly though, because there’s never one seller who has everything that you want, so you wind up making 10 or more orders for just one model. About how many LEGO parts are in one of your models, and what is an approximate cost per model? The models I have, on average, range between 3,000–4,000 pieces; the largest one is 22,500 pieces. A general rule for LEGO is that every 1,000 pieces costs around $100. But it really does depend on what kinds of pieces you’re using. Do you have a favorite model overall? It’s hard for me to pick a favorite because there are parts in each one that I think work really well. One building can’t hold all of the cool stuff! If I had to pick as close to favorite as I could, I’d choose the Parliament model. The thing I love about designing early skyscrapers and landmarks is that you really get to use some unique and often oddly shaped pieces to express just the right amount of detail. The Houses of Parliament is, without a doubt, the first example of neo-Gothic architecture and has informed many subsequent American skyscraper designs of the early twentieth century. Having already done some of these skyscrapers, it was a challenge to work backwards in a way, utilizing a wealth of techniques I had theretofore developed, as well as many that are unique to this particular model. There’s also the challenge of capturing the expansive horizontal presence of such a building, while at the same time accommodating the trademark verticality of the neo-Gothic style. 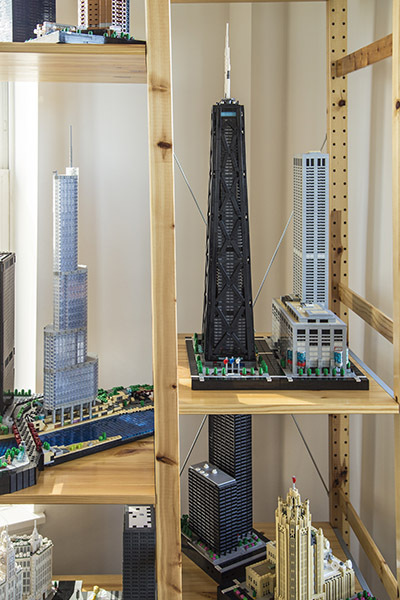 Your Chicago-scape currently features at least 23 buildings across a 5’x5’ platform. At what point will the sidewalk end? Please describe a challenge you’ve faced. I think time will tell how expansive I end up making this project. I’ve considered several practical borders for the model, but obviously nothing is set in stone (or plastic, rather) until I actually design and build up to these borders. But I would say that up to the 900 or 1000 North block of Michigan Avenue is ideal for the north border; enough of the lake to fill out all of Navy Pier to the east; Roosevelt Road to the south, though probably with a further extension for the Museum Campus and Soldier Field; and likely a shifting border to the west, up to the highway in the West Loop area. Currently, the layout is anchored by several of the taller skyscrapers throughout the city. The largest chunk so far is obviously my North Loop layout, comprising everything from Marina City and Trump Tower to Randolph Street at the north end of Millennium Park. My plan is to work on expanding a few other areas before I start bringing more into this layout. By the time Block City in July comes around, I should have a sizable chunk of North Michigan Avenue and the Water Tower area added to my current John Hancock + Water Tower Place layout. One of the challenges of creating this urban landscape with the level of accuracy that I tend to strive for is integrating buildings that are not situated directly on the Chicago street grid. My Trump Tower model is perhaps the best example of how I’ve tackled this issue. Because of the bend in the Chicago River, the base for that whole model is rotated to reflect this shifting condition. Since Trump Tower was one of the first Chicago models I made, I’ve ended up completely redesigning the base three times as I started to fill in the surrounding buildings. Most people get overwhelmed when I describe this willingness to knock it down and redo it, but I think that’s part of the design process. One thing that studio has taught me is that if something isn’t working, you have to find a way to make it work with the set of rules you’ve established for yourself. Most of the time, that requires the resolve to first, admit this, and second, to act on it. LEGO Certified Professional Adam Reed Tucker currently has an exhibit of ginormous landmark models on display at the Museum of Science and Industry. Is there another LEGO artisan whom you admire or have you pretty much been a solo flyer? I’ve actually helped Adam on a number of projects since 2011; for a while, I guess you could say I was his apprentice. The first project I helped him out on was a 10-foot model of the Burj Khalifa that was actually sent to Dubai for permanent display. 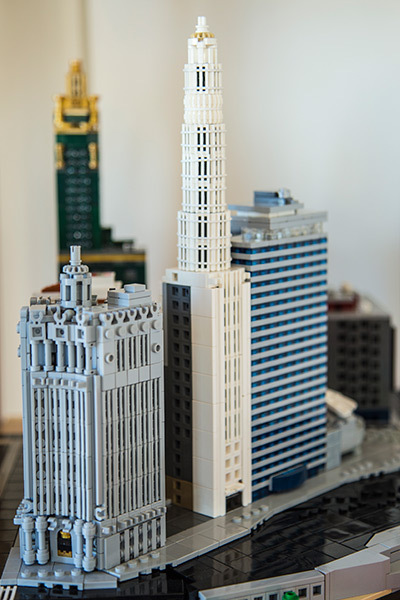 I’ve also helped him out on a couple of Willis Tower models, one of which is on display at the Water Tower Place LEGO Store, and most recently, a sprawling model of Frank Lloyd Wright’s Taliesen West, which is now on permanent display at the actual building. I would say that my time working with Adam was truly my first exposure to learning under someone with an architectural education. He taught me a lot as far as architectural expression through an artistic medium is concerned. Though my years of studio and architecture studies have more heavily informed what I do with LEGO now, my years working with Adam provided the foundation, so to speak.